Do you work within the childcare sector? If so, we would like to tell you more about upcoming childcare events and expos that are both fun as well as informative. If you are looking for inspiration, then our superb selection of seminars will help to stimulate your creativity and broaden your understanding. At Broadway Events, we pride ourselves on organising expos and events for childcare that aims to promote new and innovate ways of teaching and motivating young children. We understand how active a child’s mind can be and simply relying on tried and tested methods can cause their development to stagnate. Our Childcare Expo is a fantastic way to engage with other like-minded individuals working in the early year’s sector to share and discover new ideas. Not only does the Childcare Expo offer a wide choice of free events but there are plenty of resources to be gained too. From nursery owners and managers to childminders and early year’s professionals, your business can only stand to benefit from the expertise on offer. If you missed out on our London Childcare Expo, then the great news is that there is still time to take in one of our childcare expos and events. From 17th-18th June, EventCity in Manchester will be playing host to a range of fantastic seminars and workshops so why not head on down? When looking for childcare events and expos they don’t come more educational than this. 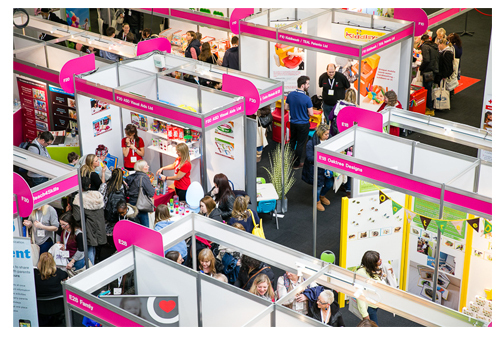 Hosted by Dave Benson Phillips, the make & create stage in Manchester will challenge visitors to create a superb resource for early year’s settings. Contestants will be provided with a selection of free and recycled materials, and the winner will receive a fantastic prize. Want to have your say on the current state of the early year’s childcare sector? Then pay a visit to the snap & share zone at the Childcare Expo. Expos and events for childcare are an amazing way to share your views so why not have your photo taken while you voice your opinions on social media. Of course, the fundamental purpose of any childcare expos and events is in learning something new. The superb learning location will provide you with a whole host of guidance material, interactive zones, fun activities and demonstrations. When you leave our Childcare Expo, you will be buzzing with new and exciting ways to give the children in your care the very best opportunities. While you are here, be sure to get your photo taken with our 5ft rabbit named Bernard. With so much on offer, it’s no surprise that Broadway Events are the foremost experts in organising expos and events for childcare. If you are unable to make it to our Childcare Expo in Manchester and do not worry. We will be hosting yet another great event, this time taking place in the Midlands from the 30th Sept – 1st October. Why should you attend the Childcare Expo? Click here if you would like to exhibit or sponsor. Alternatively, contact us today on 01425 838393 to find out more about our childcare events and expos.